A few weeks ago, I attended the Garden Writers Association conference in my hometown of Chicago. I joined their organization in 2015 when I discovered it was open to all garden communicators, including speakers, writers, and photographers. Three years ago, I was a garden speaker and I was anxious to hone my craft. Since then, I have become an author, having just finished my manuscript for my upcoming book that will be published next year by Timber Press. It was a daunting task, but I am happy to have accomplished such a goal. Because of my affiliation with GWA, I now have a network with many talented and accomplished authors and speakers. 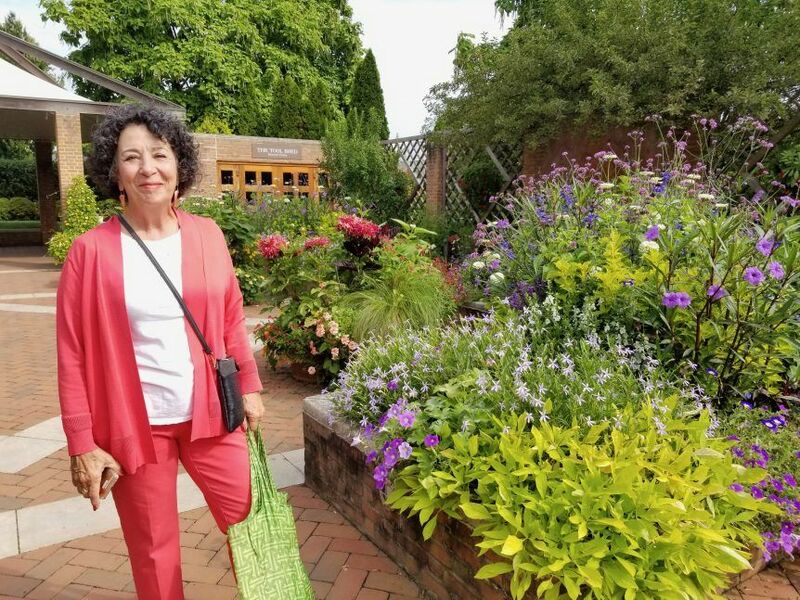 While in Chicago, I had the pleasure of going to the Chicago Botanic Garden, which is an extraordinarily beautiful place on earth. I am always happiest when I am in a garden and this one was no exception! I went with another gardener, Janet Davis, from Toronto. (Thank you for the above photo Janet.) 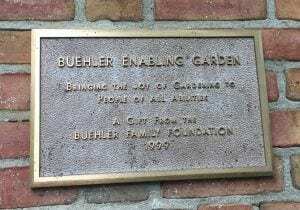 Her goal was to photograph the prairie and meadow, so I went off by myself to explore the Buehler Enabling Garden. 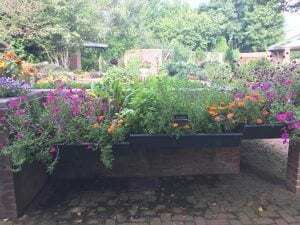 What is an Enabling Garden you may ask? 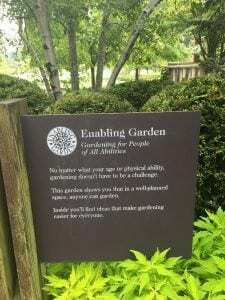 When the garden was first conceived, instead of referring to it as a garden for people with disabilities, they wanted a more positive spin on it, so they called it an Enabling Garden. There was a threat of rain, and the girl at the front desk indicated that sometimes the volunteers don’t come in on rainy days. Not to be deterred, I bought an umbrella in the gift shop and made my way back to the Enabling Garden. 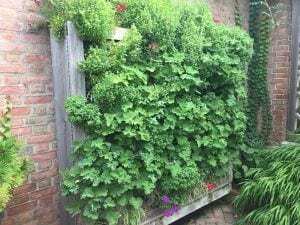 I just love this vertical garden. It is easy on your back to maintain. These raised beds were built so gardeners in wheelchairs could comfortably work in the garden, making them accessible by all. The sign on the Tool Shed and Learning Resource Center indicated it would not be open for another hour. I found a bench and decided to wait. After all, I had come this far. Moments later, the gate opened and in came the volunteers. 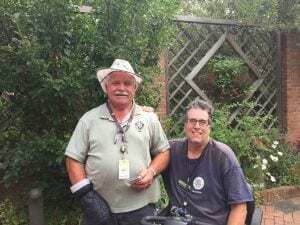 Peter Dogiakos (on the left) suffered a stroke when he was 37 years old and he has been volunteering at the Buehler Enabling Garden for the past 22 years. His side-kick was Mark Rosenbaum, (on the right) who gets around on a scooter. He explained Peter’s non-stop dedication to volunteering six days a week. He is happy to work along side of him. 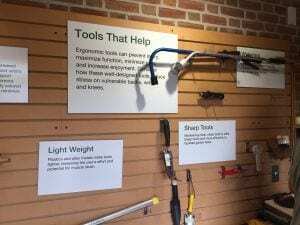 I checked out their selection of adapted and ergonomic tools and picked up a book The Enabling Garden, Creating Barrier Free Gardens, by Gene Rothert, President of the American Horticultural Therapy Association, and Manager of Urban Horticulture at the Chicago Botanic Garden. Published in the 90’s, Peter talked about the well-worn book as it was the bible for his resource center. I gave Peter my business card and told him about my upcoming book and watched his eyes light up with joy! He loved the idea of another book helping gardeners of all abilities keep gardening. When it comes out, you can bet Peter’s Resource Center will receive one. We hugged and I said good-bye. In a very short time, both men captured my heart. Speaking of heart, after I left the GWA Conference, I headed west to my sister’s home in Aurora, where we had a small Italian “la famiglia” reunion for 60 people. Talk about heart.